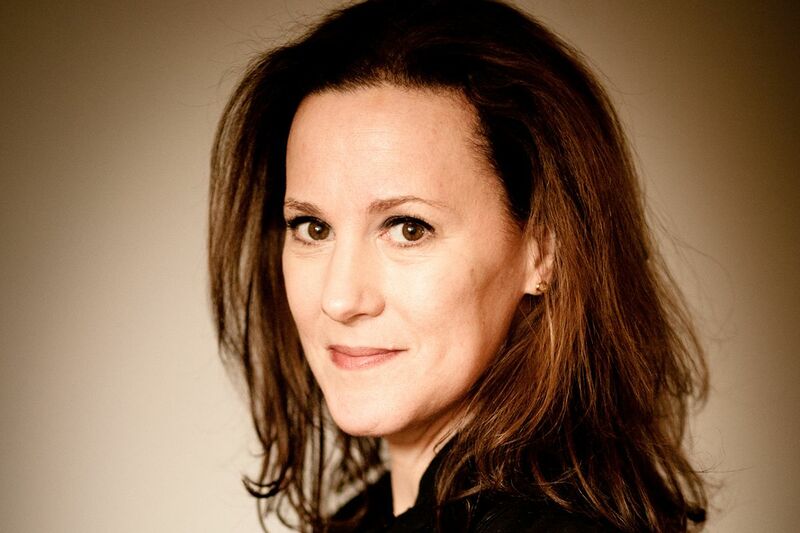 I’m not entirely certain where my enthusiasm for red comes from: it’s a color that flatters me, so that’s nice, but the attraction is about more than that. 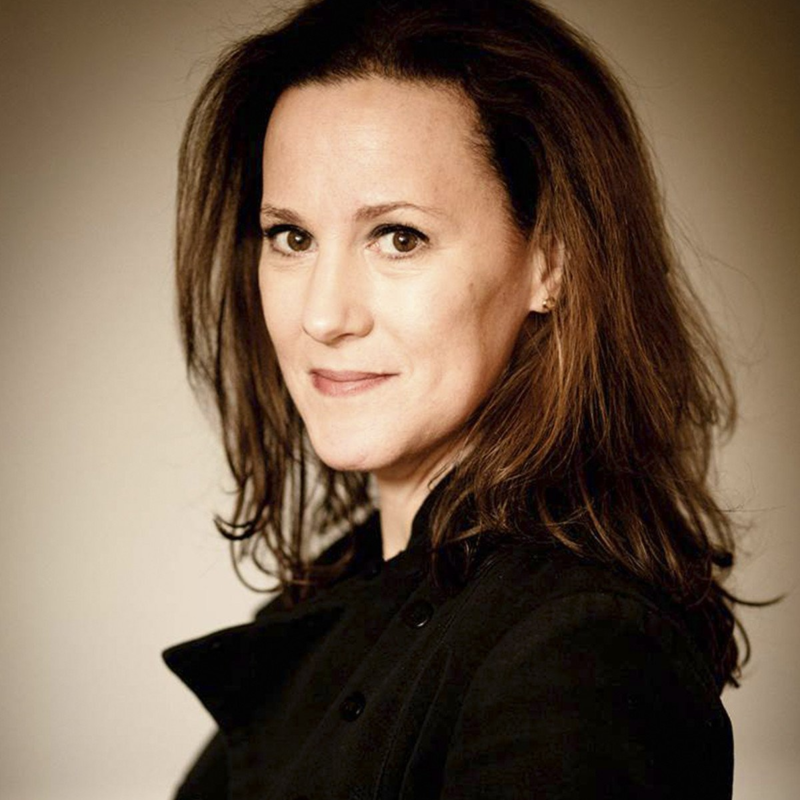 I also like that it is so unstoppably bold, and that it plays well with so many other colors. Wearing red puts a little spring in my step, too, because it makes me feel like I made an effort not to default to the same old black. A nice shrunken trench that’s kind of similar to the one Giovanna Battaglia is wearing in the above picture, except for that hers is leather. Seriously, could this dress be any easier? 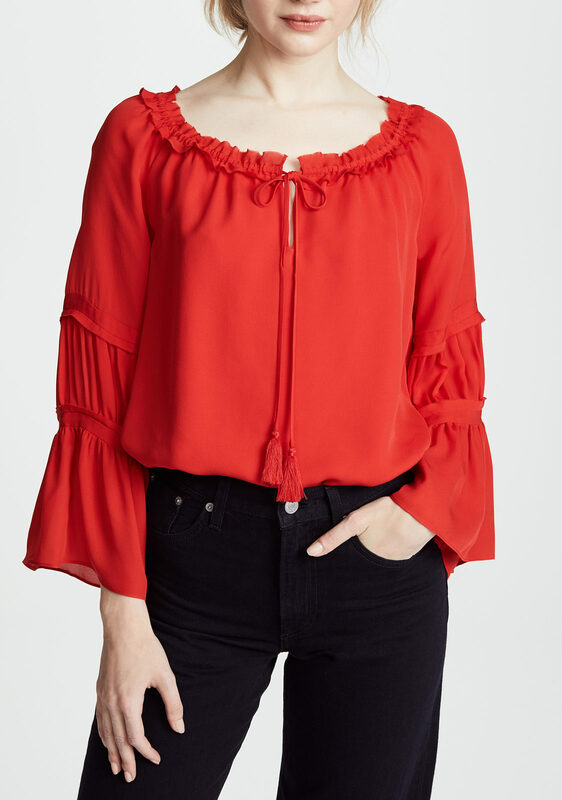 This chiffon top is rather sweet. I like the business on the sleeves of this blouse. 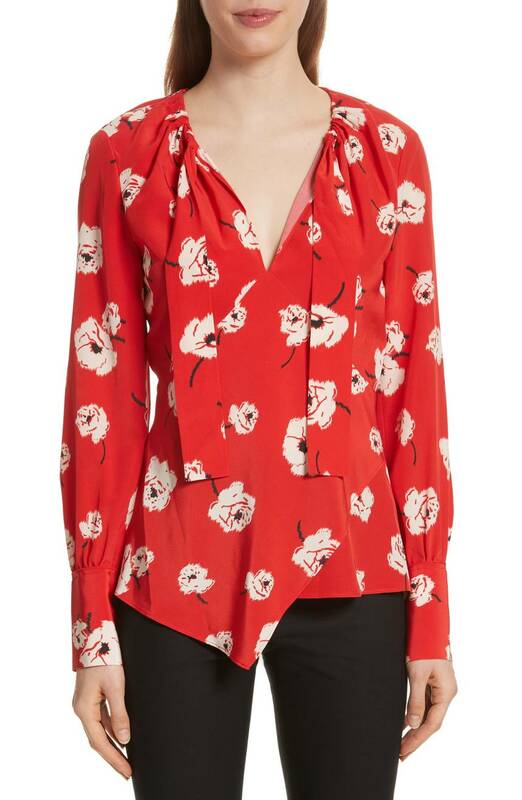 A lovely floral blouse with a cool asymmetrical hem. 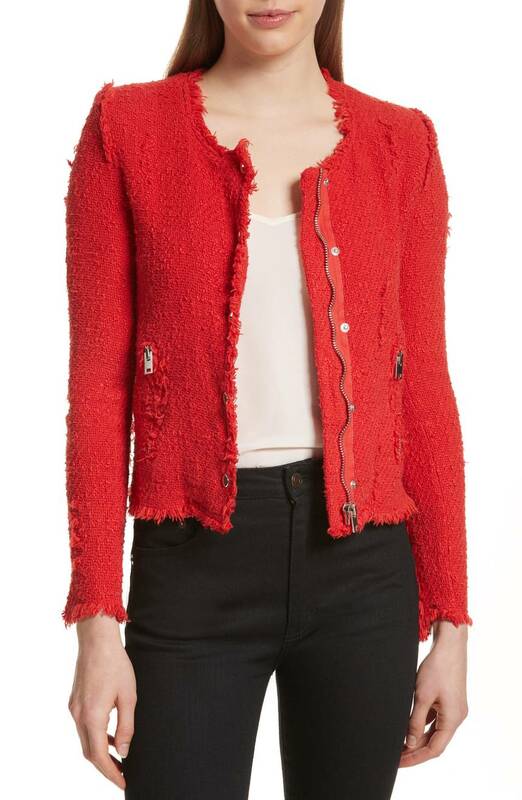 I’d love a red blazer—it would look fantastic with just jeans and a graphic tee. There’s a very subtle dot print on this well-priced dress. 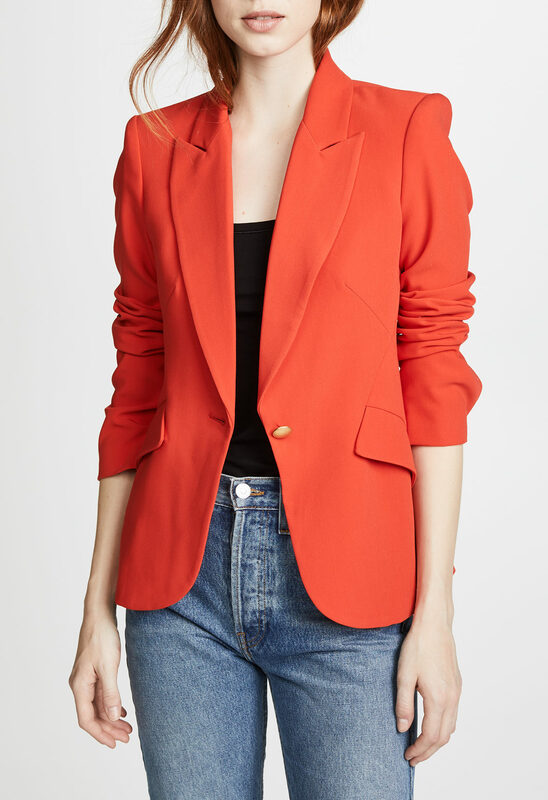 I own this Iro jacket in white, and would almost consider buying it in red too, because it’s so versatile, and is a good stand-in for a blazer when you’re just not in the mood for a blazer but need to look polished. The side pleat on this skirt is a subtle-but-statement-y touch. 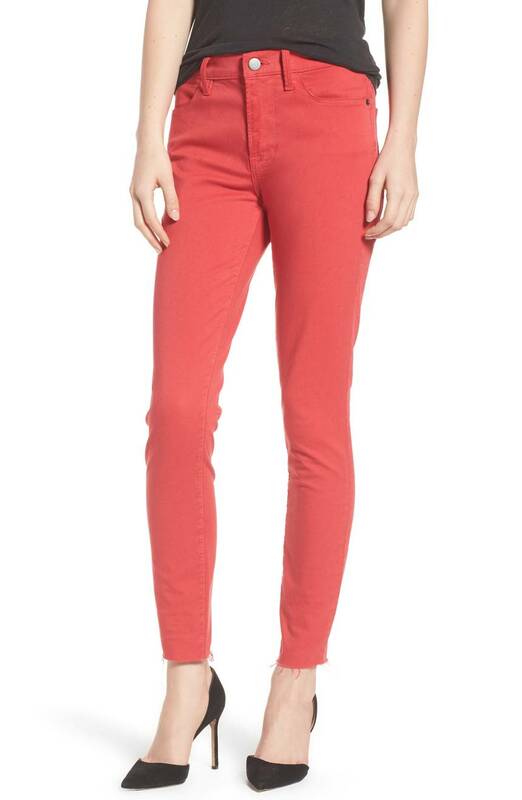 Women who can pull off red jeans are cool and I wish I was like them. I can never resist a shaggy sweater. 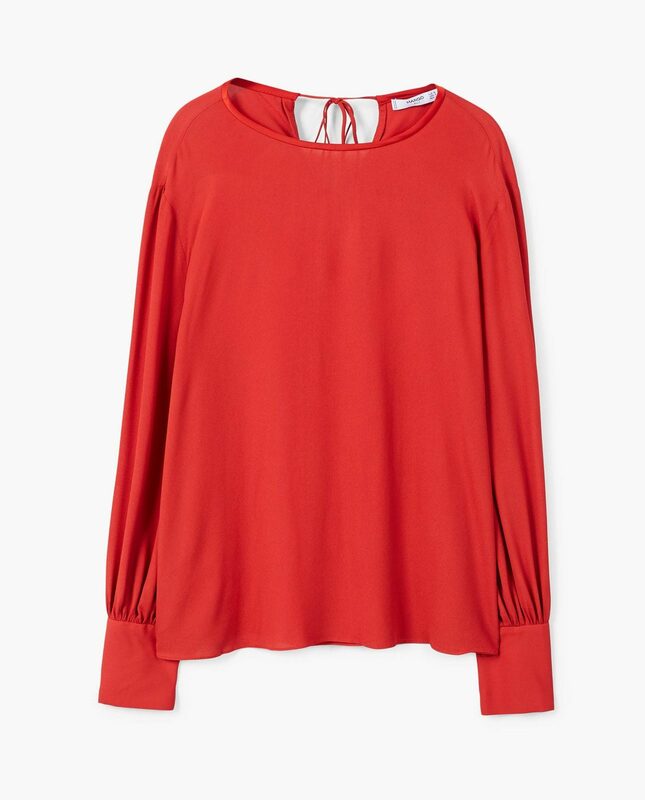 A very well-priced, work-worthy blouse. 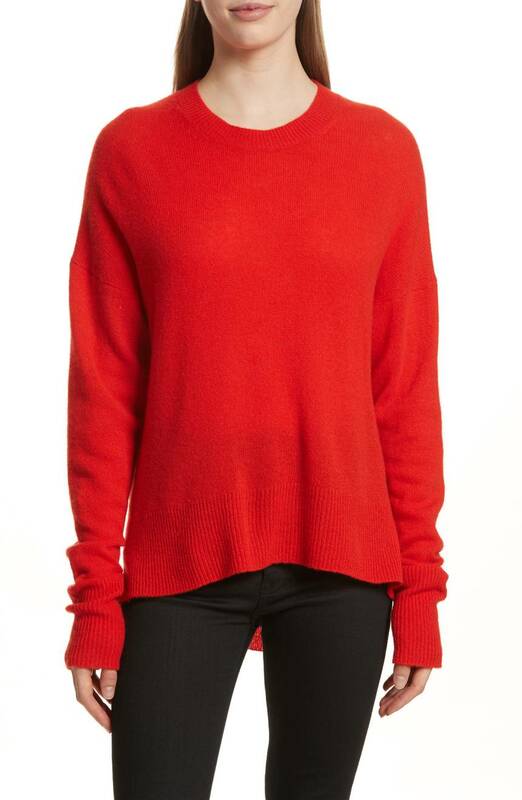 The shirttail hem on this cashmere sweater makes it an excellent choice for when you’re in a casual mood. A very streamlined, pretty dress with a really nice neckline. 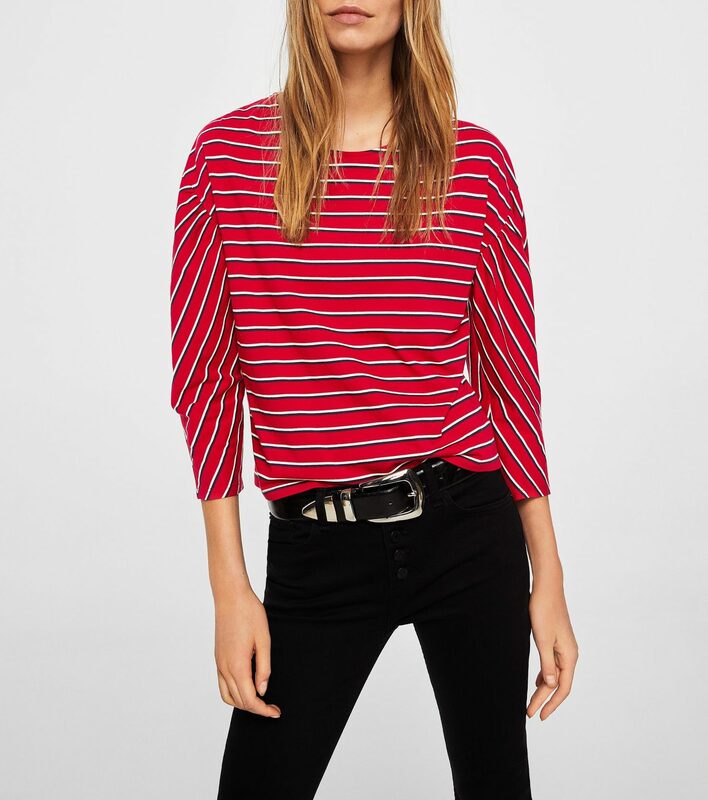 Just a good striped tee. I’d wear these pull-on pants with a crisp white button-down. I’m not the hugest fan of an off-the-shoulder look, but I do think this dress is quite graceful. 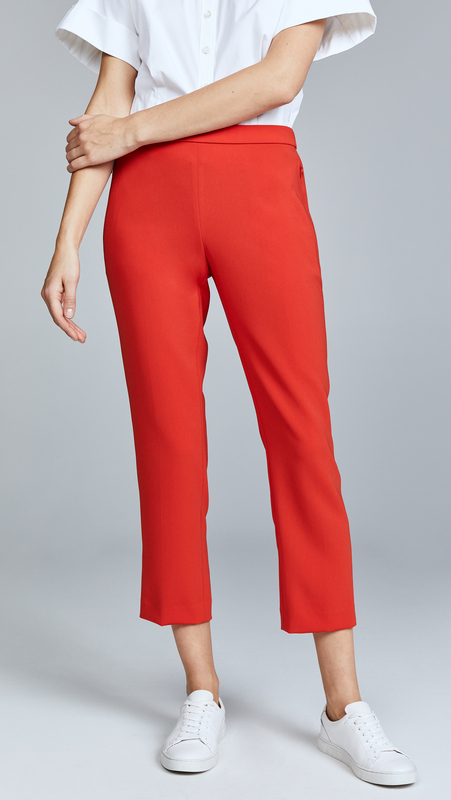 My friend Pavia is looking for wide-leg trousers, so I included these for her. 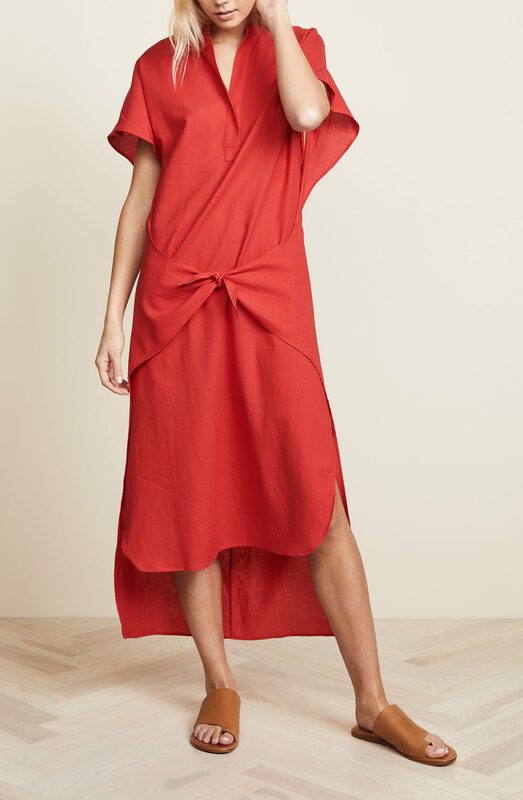 One-shoulder silhouettes are another look that is not so much my thing, but I think I’d wear this Mara Hoffman dress all summer. This blouse is nicely oversized. I’d go for the half-tuck. The matchy-clashiness of the prints on this dress appeals. And here’s a post I did on grey clothes for (mostly) under $100. There are so many great things in this post. I love the both trench coats. I love the “Jackie O.” belted dress. I love that you feature so many different styles to appeal to a wide array of readers. But the Vince Wrap Front Dress? It looks like something created as a joke to humiliate gullible fashion victims. But hey, reasonable people can disagree. There are so many great things in this post. I love the both trench coats. I love the "Jackie O." belted dress. I love that you feature so many different styles to appeal to a wide array of readers. But the Vince Wrap Front Dress? It looks like something created as a joke to humiliate gullible fashion victims. But hey, reasonable people can disagree. Ha! I came here to say that I would wear the hell out of that Vince dress. Tomato, tomato. Red has been very much on my mind…hence my red velvety jeans that I’ve been wearing all winter and my newest purchase––a pair of red Puma sneaks that I really love because they have red soles! 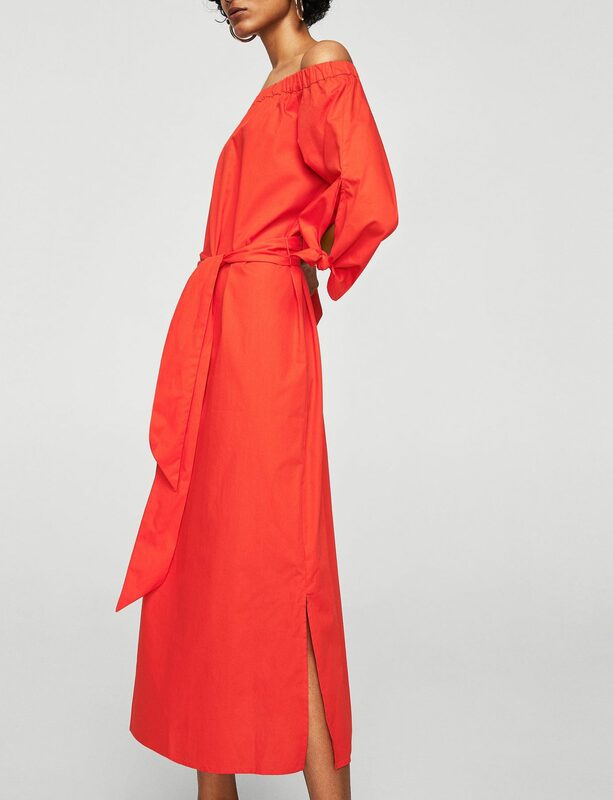 Going to check out the red cashmere sweater in person (it looks very orangey red in the photo and I can’t wear an orangey red) and I am so, so, soooooo tempted by the Iro jacket that my credit card is practically levitating out of my purse! Red has been very much on my mind...hence my red velvety jeans that I've been wearing all winter and my newest purchase––a pair of red Puma sneaks that I really love because they have red soles! 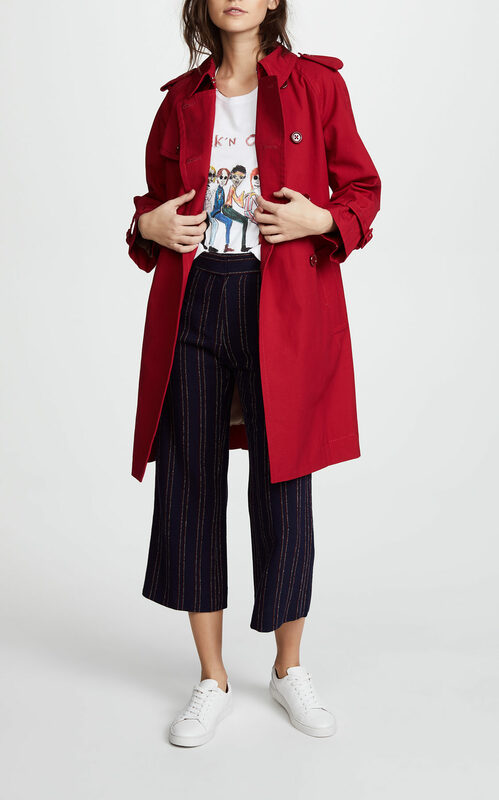 Going to check out the red cashmere sweater in person (it looks very orangey red in the photo and I can't wear an orangey red) and I am so, so, soooooo tempted by the Iro jacket that my credit card is practically levitating out of my purse! 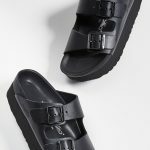 Has anyone had any luck actually purchasing and wearing something from & Other Stories? I love the look of their items esp when Kim features them here. However, whenever I’ve tried them on (I refuse to order from them as, like Anthropologie, their sizing seems to be all over the place), I’ve found them to be enormously unflattering. Recently I was in one of their stores and tried on a few things in my regular size that fit very strangely, and a dress 2 sizes larger that I couldn’t even zip. Plus the stores I’ve been in have been largely empty of customers, yet quite large and in prime-real-estate locations, so I’m not sure how they’re paying the rent. Any other experiences? 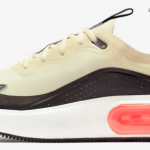 Has anyone had any luck actually purchasing and wearing something from & Other Stories? I love the look of their items esp when Kim features them here. However, whenever I've tried them on (I refuse to order from them as, like Anthropologie, their sizing seems to be all over the place), I've found them to be enormously unflattering. Recently I was in one of their stores and tried on a few things in my regular size that fit very strangely, and a dress 2 sizes larger that I couldn't even zip. Plus the stores I've been in have been largely empty of customers, yet quite large and in prime-real-estate locations, so I'm not sure how they're paying the rent. Any other experiences? They’re always mentioned by fashionable people, yet the one time I ordered a bunch of stuff from them, it was all hideously cheap-looking and unflattering. Over the years I have found decent things at H&M and even Forever 21, so it’s not that I’m a snob, but… after that one order, I have no desire to set foot in an & Other Stories store. They're always mentioned by fashionable people, yet the one time I ordered a bunch of stuff from them, it was all hideously cheap-looking and unflattering. Over the years I have found decent things at H&M and even Forever 21, so it's not that I'm a snob, but... after that one order, I have no desire to set foot in an & Other Stories store. I bought a couple of things (on sale) from Other Stories last year. Quality was just ok. I haven’t ordered (or even scoped them out) since. I’ve had the same experience with Mango. I also just tried Uniqlo (a couple of thin sweaters) and was sorely disappointed. I’m rather shocked to say that I bought oodles of sweaters from H & M this fall/winter season and the quality was quite good! I bought a couple of things (on sale) from Other Stories last year. Quality was just ok. I haven't ordered (or even scoped them out) since. I've had the same experience with Mango. I also just tried Uniqlo (a couple of thin sweaters) and was sorely disappointed. I'm rather shocked to say that I bought oodles of sweaters from H & M this fall/winter season and the quality was quite good! I had a short-sleeved army-green shirtdress from H&M that I think cost $25, and I wore it for probably five summers straight — sometimes their stuff is bizarrely well-made for the price. But for the past few years I’ve found myself in the “fewer, better” camp, mostly because I don’t love rayon and polyester anywhere near as much as Mango, Anthro, Madewell, etc. do. I had a short-sleeved army-green shirtdress from H&M that I think cost $25, and I wore it for probably five summers straight -- sometimes their stuff is bizarrely well-made for the price. But for the past few years I've found myself in the "fewer, better" camp, mostly because I don't love rayon and polyester anywhere near as much as Mango, Anthro, Madewell, etc. do. Funny! I just bought a couple of items from H&M also, after not setting foot in one for several years, and they seem to be of decent quality, tailoring, etc., also. (Cheapie top and sundress for Spring.) And I think & Other Stories is the same company, just the ‘upscale’ version (I could be wrong?). Funny! I just bought a couple of items from H&M also, after not setting foot in one for several years, and they seem to be of decent quality, tailoring, etc., also. (Cheapie top and sundress for Spring.) And I think & Other Stories is the same company, just the 'upscale' version (I could be wrong?). You’re right. & Other Stories is supposed to be the more stylish big sister to H&M. I’ve had some luck at & Other Stories, but their stuff runs small, especially pants and skirts, so I order a size up or order in two sizes and return. Last summer I bought a 100% cotton printed midi skirt from them that’s one of my all time favorites. So I wouldn’t give up on them yet. I love good rayon, or viscose which is the same thing, right? It drapes beautifully and is cool in summer. I have a collection of women’s Hawaiian shirts, some of them vintage, and the best ones are rayon. It’s polyester that scares me. 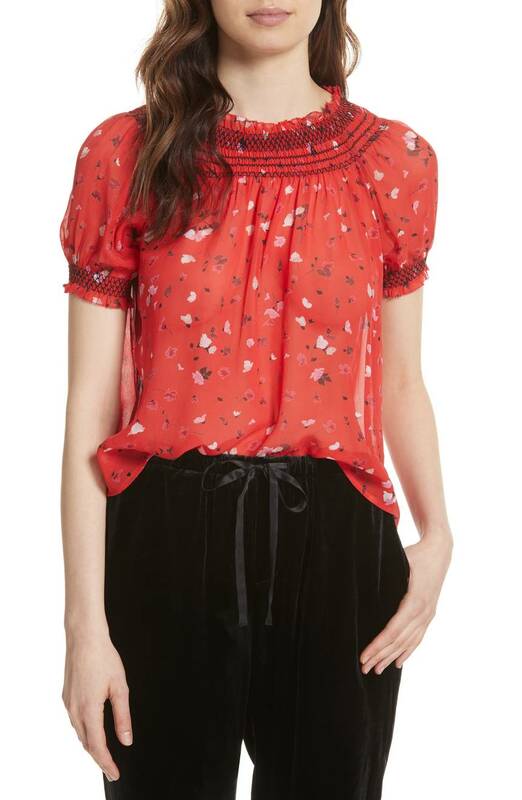 There’s much that looks cute on the Mango site, but I’m afraid the polyester will be shiny and creepy. 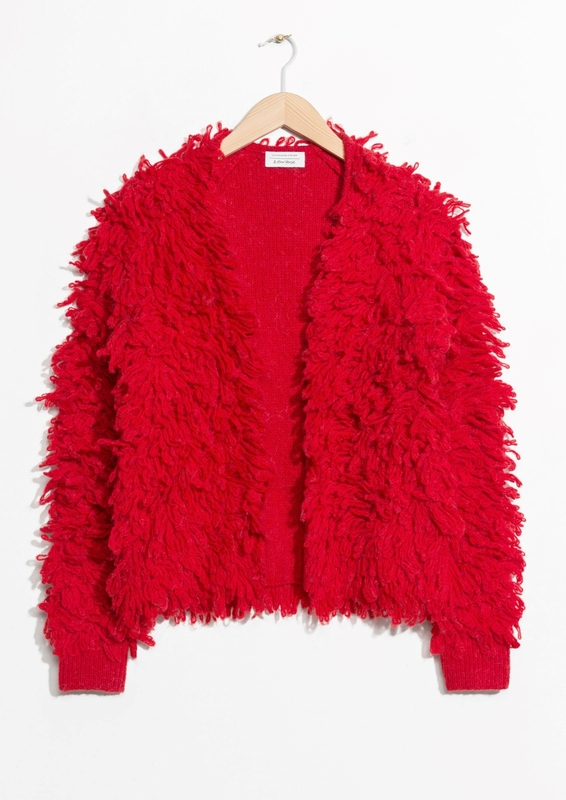 I know GOACA are down on Zara, but their quality and styling continues to amaze often. I abandoned Anthro a long time ago cause their vibe is too suburban Mom for me. Uniqlo’s $30 linen shirts are fantastic. I’m just bummed cause they don’t offer a black one. You're right. & Other Stories is supposed to be the more stylish big sister to H&M. I've had some luck at & Other Stories, but their stuff runs small, especially pants and skirts, so I order a size up or order in two sizes and return. Last summer I bought a 100% cotton printed midi skirt from them that's one of my all time favorites. So I wouldn't give up on them yet. I love good rayon, or viscose which is the same thing, right? It drapes beautifully and is cool in summer. I have a collection of women's Hawaiian shirts, some of them vintage, and the best ones are rayon. It's polyester that scares me. There's much that looks cute on the Mango site, but I'm afraid the polyester will be shiny and creepy. I know GOACA are down on Zara, but their quality and styling continues to amaze often. I abandoned Anthro a long time ago cause their vibe is too suburban Mom for me. Uniqlo's $30 linen shirts are fantastic. I'm just bummed cause they don't offer a black one. Their silk blouses are great! I stock up when they’re on sale. Everything else is hit or miss– I have a nice pair of trousers from there, but have had to send back several dresses. Their silk blouses are great! I stock up when they're on sale. Everything else is hit or miss-- I have a nice pair of trousers from there, but have had to send back several dresses. …and what about Maya Rudolph’s gloriousness of a red dress at the Oscars??!! ...and what about Maya Rudolph's gloriousness of a red dress at the Oscars??!! I have a really cool pair of red, cropped pants but I cannot wear them without feeling like I’m on my way to a Christmas party. Any suggestions?? 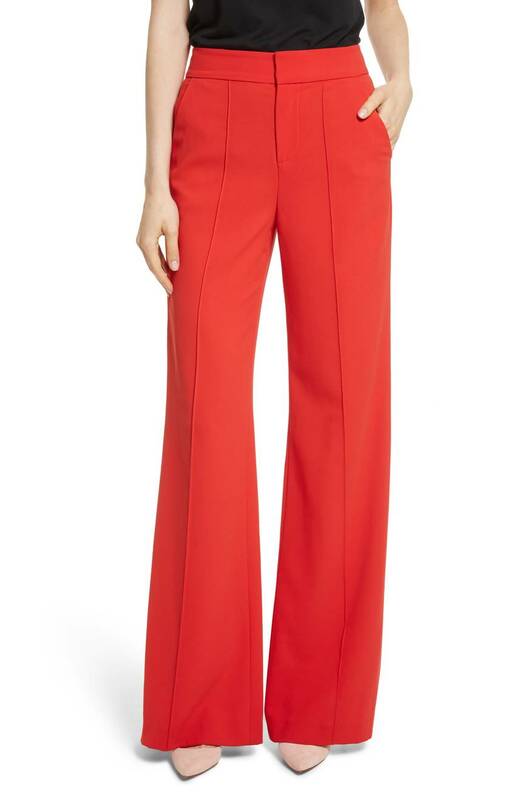 I have a really cool pair of red, cropped pants but I cannot wear them without feeling like I'm on my way to a Christmas party. Any suggestions?? I wear mine with a blue blazer and striped untucked shirt. A pale blue top–solid, striped, or patterned–looks great with red pants. Grey looks good, too. Neither will have you looking like you’re wearing your Christmas outfit 4 months later. I think black with red also sometimes gives a stale holiday vibe. A pale blue top--solid, striped, or patterned--looks great with red pants. Grey looks good, too. Neither will have you looking like you're wearing your Christmas outfit 4 months later. I think black with red also sometimes gives a stale holiday vibe. I’m fine with poly (I have some poly stuff, including vintage, that is indestructible), but I agree with you about rayon. It wrinkles easily and I’ve had garments that almost dissolved in the armpits, whether from sweat or deodorant, not sure. In any case it only seems to look good the first few times you wear it. I'm fine with poly (I have some poly stuff, including vintage, that is indestructible), but I agree with you about rayon. It wrinkles easily and I've had garments that almost dissolved in the armpits, whether from sweat or deodorant, not sure. In any case it only seems to look good the first few times you wear it. My wardrobe is about 95 percent neutrals. Even my printed stuff is neutral, LOL. Last year around this time, due to I don’t know what (maybe stress from my father’s illness) I broke with tradition and bought a bright red wool coat by Closed that was on sale. Totally out of my comfort zone, but I’ve worn the heck out of it and have come to the conclusion that on me red just might be a . . . neutral. My wardrobe is about 95 percent neutrals. Even my printed stuff is neutral, LOL. Last year around this time, due to I don't know what (maybe stress from my father's illness) I broke with tradition and bought a bright red wool coat by Closed that was on sale. Totally out of my comfort zone, but I've worn the heck out of it and have come to the conclusion that on me red just might be a . . . neutral.